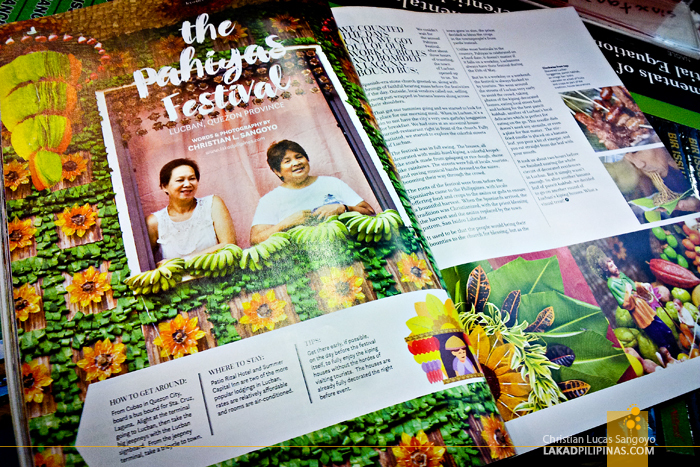 My article about Quezon’s colorful Pahiyas Festival, beautifully laid out on a spread, was recently published at Explore Philippines fifth issue. It was filed under their Jetsetter column which features travelers covering popular destinations within the country. I was actually backpacking across Laos when I was contacted by the magazine’s editor-in-chief. It was no problem writing the piece. The difficulty though, lies with the accompanying photos, as all my high-resolution images are stored on my home computer. Thank goodness, my image bank was well organized and I was able to instruct my sister to fetch them for me with minimum fuss, lol.